I wanted to make a cute art supply organizer that can sit in the middle of our school table and hold supplies. This is what I came up with; it was super-easy, and the total cost was under $17! I bought a $7 wooden lazy susan at IKEA, then found little Valentine’s Day metal pails in the dollar section of my local Target. 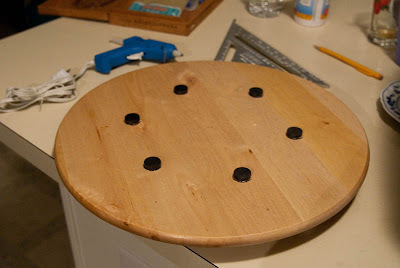 I didn’t want anything to fly off when we spun the lazy susan, so my original plan was to drill a hole in the bottom, and screw them to the top of the lazy susan. I still think that’s a good idea, but it would have made it harder to clean out the containers, or to change them later if I’m so inclined. After that, I just set the little buckets on top of the magnets and filled them with our supplies. As soon as the girls put the markers and such in there, they both immediately started drawing, so I think that means this little project was a success! LOVE this…I was thinking of making something similar and it’s given me something to go on! Just finished mine today! Target had Lazy Susans for $8 and the tins for the 4th!! That’s so cool, and the magnets make me feel better, I was thinking that looked like a recipe for disaster at first, but I love it! a friend of mine has done this and she put a trash can in the middle of the buckets!! she had a larger metal tin she used but i found a fun little swing lid trash can at dollar general for $1 that is gonna be used in my center! I saw this on Jolanthe’s blog and also on Kris’ blog at Weird Unsocialized Homeschoolers. What a great idea! I’m headed to Target in the morning before all of those little tins are gone! What a great idea. I can see setting something like this in our supply closet and using it to store art supplies, using the magnets means they could take the bucket to their desks and return them when finished. I would love to do this in my classroom. I’ve been checking on lazy susan’s online. What size is this one? Ours is about 15-inches in diameter. My kids would love this… I have those exact Target buckets and can’t wait to head to IKEA! Thanks for the idea! Love the idea. I had the kids do this at their desks in their rooms and it has made a huge impact on organization with a flash of fun. and I have a Lazy Susan from Goodwill!!! It was meant to be! I love this. It is adorable and super-functional. I am going to pass this along to our homeschool group!!! I love this! I found some adorable owl tins at Walmart today and am making this right now (except obviously taking a break to type this….oh and to bandaid my finger after I had mishap with my knife while prying off magnets that were the wrong size 🙂 . It’s so cute! Thanks for the great idea!! Wow. I’m just now finding the blog hop of schoolrooms. GREAT IDEAS!!! This is the coolest idea I’ve seen in forever!!! I want one of these for our eating table as well. We are a family of 7 and I can see this with napkins in one tine, forks in another, and so on. We have kitchen helper’s each night and this would make setting the table for our littles so much easier. OK, I have to show this to DH now. And the magnets from your DH–that is genius!!! Oh, it would be great in the middle of a big family kitchen/dining table! Love this! & made it for my little girl! Ahhh….so happy that all her art stuff will be organized! What a great idea! Thanks for sending me the link, Jamie!